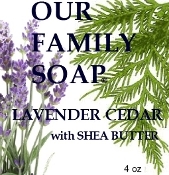 Our classic soap scented with Lavender/Cedar. Women and Men alike will fall for this warm, sweet and spicy scent. A generous 4 oz. bar. A combination of olive oil, coconut oil, palm oil, sodium hydroxid (lye, neccesary for soap making), lavender/cedar EO.Shea Butter.